Elizabeth spent six years as a Carmelite nun, but like St Thérèse of Lisieux she advanced in holiness in a very short time. As a child Elizabeth had a wicked temper. Once she experienced the sacrament of Penance and her First Communion, her ‘conversion’ began. 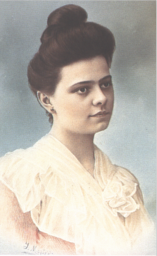 The image shows Elizabeth as a young woman before she entered Carmel at Dijon in 1900. She died six years later. John Murray PP tells her story. They were almost contemporaries, both of whom followed the way of Carmel. 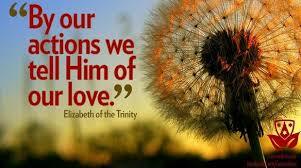 While Thérèse Martin gave the world her ‘little way’, Elizabeth Catez was truly the ‘prophet of the presence of God’. When Pope John Paul II beatified her on 25 November 1984, he presented her to the Church as one ‘who led a life hidden with Christ in God’. A terror or a saint! Blessed Elizabeth of the Trinity, who was born in France in 1880, did not have such auspicious beginnings. ‘You will either be a terror or a saint,’ her mother had said. The stubborn little girl who often demanded her own way, had inherited the military spirit of her ancestors. Her father Joseph had enlisted in the French army and had a successful military career, receiving the Legion of Honour in 1881. After the early death of her father, Elizabeth’s outbursts of anger increased. However, once she experienced for the first time the sacrament of Penance, it brought about what she styled her ‘conversion’. She henceforth began to struggle noticeably against her violent temper. In the spring of 1891, when she was almost eleven years old, Elizabeth made her First Communion. She was profoundly affected by her first reception of Christ in the sacrament of the Eucharist. Her mother later testified, ‘From that day and afterwards there were no more fits of anger’. At the age of fourteen Elizabeth decided to become a Carmelite nun, having heard the word ‘Carmel’ in her spirit one day after Communion. Her mother was determined that Elizabeth would not enter until she was twenty-one. Elizabeth calmly obeyed. The next few years were spent in the local parish and as a faithful companion to her mother. She attended family gatherings and played the piano for the guests. With her mother, Elizabeth visited Lourdes and was thrilled to receive Holy Communion at the Grotto. In February 1900 the young aspirant to the Carmel of Dijon was introduced to a Dominican friar, a friend of the nuns. This two-hour conversation with Fr. Valee was to change her life and give her the direction for her future spirituality. Elizabeth asked for help in understanding her interior experience – her need for silence and recollection – and her sense of an inexplicable presence in the depth of her soul. The Dominican proceeded to deepen her awareness of the truth of the indwelling of the Trinity in the soul of the baptised: that not just Christ, but that all three of the Trinity – Father, Son, and Spirit – were present in love in her soul. As she was waiting to enter her beloved Carmel, Elizabeth lived the life of a typical young, active Catholic laywoman of her time. She sang in two choirs in her parish; she helped prepare children for their First Communions, and she animated a type of ‘day care’ for the children of those who worked in the local factory. The personality of this energetic young woman had blossomed from her earlier years. It should be noted that Elizabeth was also a very gifted musician who could have made a career with her talent. From the age of seven, she studied music at the Conservatory of Dijon, winning several prizes for her skill at the piano. ‘No one can interpret the great masters like Elizabeth,’ wrote one admirer. At last Elizabeth entered the Carmel convent. There she was at home. As a Carmelite she received the name of Sister Elizabeth of the Trinity and made her profession on the Feast of Epiphany, 1902. From reading St. Paul, her great scriptural mentor, Sister Elizabeth discovered her vocation. She would be a ‘Praise of Glory’ or Laudem Gloriae, praising God dwelling within her offering a ceaseless Sanctus. ‘God dwells within you, do not leave Him so often,’ she advised. To another she wrote, ‘It is wonderful to recall that, except for the vision of seeing God, we possess God as all the Saints in Heaven do. We can surely be with Him always and no one can take us away from Him. He dwells in our souls!’ She often referred to the Blessed Trinity as ‘my Three’. As a child, Elizabeth had found the strength to conquer her fiery temper only after having received the body and blood of Christ in the Eucharist for the first time. As a Carmelite, she would read in Paul that it was Christ ‘who made peace through the blood of his Cross’ (Col l:20), making ‘peace in my little heaven so that it may truly be the repose of the Three’. 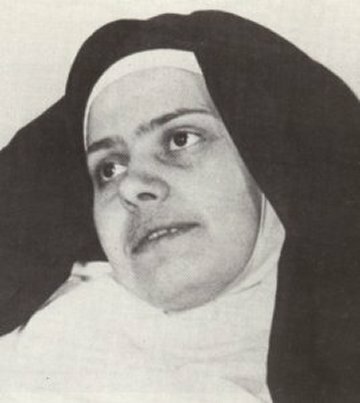 The call to praise the glory of God also included the call to share in the redemptive sufferings of Christ, to be able to say like St Paul, ‘In my flesh I am filling up what is lacking in the afflictions of Christ on behalf of his body, which is the Church (Col 1:24) – and Sister Elizabeth had to accept suffering. Early in 1906 it was noticed that Sister Elizabeth had become very weak. She made a retreat to prepare for the ‘Eternal Retreat’. She suffered for months from Addison’s Disease, a disease of the kidneys which at that time was incurable. As a result of this illness, Elizabeth suffered great fatigue, an inability to digest food, intense abdominal pains and great thirst. During the last week of her life, Sister Elizabeth’s stomach was very ulcerated, and yet she made frequent and lengthy visits to the Blessed Sacrament. On 31st October, she received the last rites. On 1st November, she made her confession and received Holy Communion for the last time. Elizabeth’s last audible words before her death were, ‘I am going to Light, to Love, to Life’.